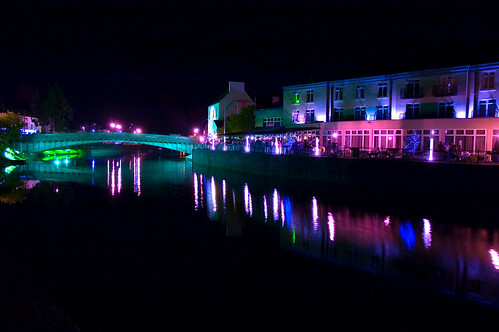 Kilkenny At Night, originally uploaded by Dave Gorman. Thoroughly enjoyed my time in Kilkenny. Four nice gigs. In one I could feel the rust in my joints but I don't think the audience were aware of or worried by it, in two others it felt like business as usual and in one it felt like business-better-than-usual. Good odds. I can't complain. It's an incredibly beautiful town but my life it's got a Jekyll and Hyde quality to it as well. The weather was amazing so by day the place was bathed in glorious sunlight only heightening its picture postcard appeal. But I went for a midnight walk on Saturday and the all day drinking had taken its toll. You could see who was a visitor from their more casual attire. The locals were all dressed to the nines - party frocks and shiny shirts were the uniforms of choice. And sunburn. Everyone looked like they were attending the wedding reception of a rich cousin they didn't like all that much. On that walk I passed three girls in tears with broken heels, three girls being helped out of the gutter by angry men, four men being helped out of the gutter by angry girls, one couple drunkenly helping each other out of the gutter, two people throwing up, two sets of lads squaring up like rutting stags preparing for a you-want-some scrap that probably never transpired and one fella clutching a blood stained hanky to his face because, I assume, he'd found someone who actually did want some. Somehow it wasn't quite so picture postcard. That doesn't sound like much of a recommendation. Which is a shame because I really do recommend it. I certainly wouldn't let a half hour stroll through a spot of drunken carnage colour my view of the place... indeed I only mention it because it was in such stark contrast to my overall impression of the place... which was overwhelmingly friendly. It's a beautiful place. And it's a really lovely festival. Th fact that everyone's doing short sets on mixed bills takes a lot of the egos out of it and the shows - or certainly all of the shows that I saw - are really well set up. Lovely. Wahey! Kilkenny! I live there! Saw your show on the Sunday with Tommy Teirnan, no rust was noticed at all. Great to meet you on Sunday night Dave. As I said, really enjoyed the set and will see ya in Fort William. I was quite sad when I discovered all the gigs you were preforming in were sold :( Glad you had a good time though! From London to Brighton to... London. Fancy A Day As A Human Sat Nav Anyone?